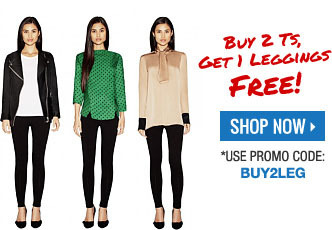 Buy 2 T’s, Get a Pair of Leggings for FREE – Limited Time. Use promo code BUY2LEG until 11/20 at 11:59 pm EST! Be sure to check out Mary-Kate and Ashley Olsen’s picks this month! This is a great way to add some basic tee’s that everyone should have in their closet!